It’s important to squeeze in a couple of strategic practice hours before a regatta starts, especially if it’s one of the first of the season. 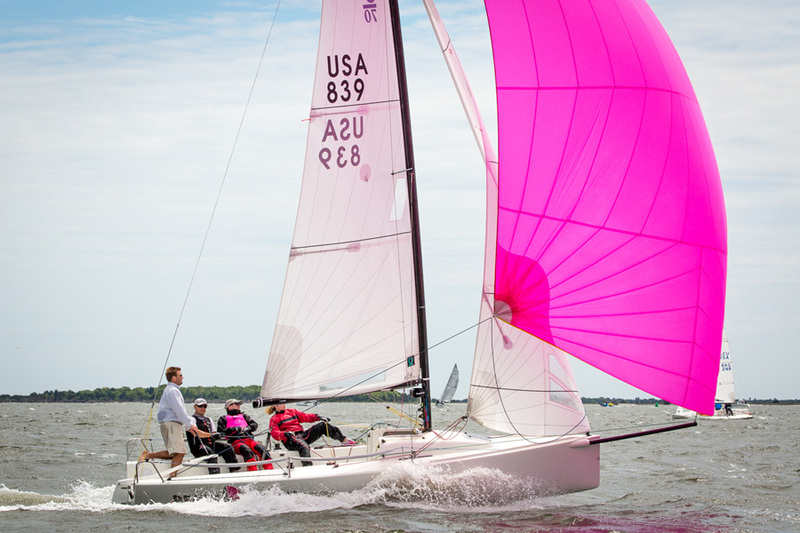 Give yourself an advantage with Quantum’s VP of Product Integration and expert sailor Doug Stewart’s pre-regatta practice tips from his experience at a number of Sperry Charleston Race Weeks over the years.. Staying in race race mode downwind - 2016 Sperry Charleston Race Week. Photo by Karen Ryan. With Charleston Race Week being one of the biggest one design events in the U.S., and with it also being one of the early events of the season, I am always amazed how few boats are out sailing before the event. I understand the enormous cost and logistics that go into competing at an event like this, but time on the water beforehand is absolutely key to being ready to race Friday morning. It doesn’t matter how close to race day it is, you can usually find some free time to practice. Always try to take advantage of any practice racing that is offered, in addtion to some of the tips below. If you’re putting your boat together Thursday, at least take advantage of the late daylight hours and sail in the evening. If you’re putting your boat together Thursday night, get off the dock early Friday morning and get on the water before the first start. All you need are a couple of hours to fine-tune everything before the race. If you want to win, practice is essential, so make the most of every practice minute on the water. Go out with a plan! Sit down the night before and know what your practice runs will consist of. Here are a few basics to hit on while you’re practicing. Get a feel for the boat. Sail in the circle you will be racing in. Make sure your sail settings are marked and legible. Talk to the crew about what you’re feeling and what settings you might want to change before race time. Tack as necessary to stay in the circle. Record wind angles. Set backstay, vang, and Cunningham, and out haul for downwind settings. Talk with the crew about body placement on the boat for the conditions. Gybe as necessary to stay in the circle. This time, pick a mark to weather and sail in race mode. Tack on every header (or every few minutes) to get yourself and the crew into race mode. Communicate like you would while racing. And don’t forget to record wind angles. Your set around the mark should be a race set. Gybe more times then you tacked on the previous upwind leg. The tendency on downwind legs is to relax – don’t. Stay in race mode. Work together as a team, and move the boat downwind. Work on crew placement and technique as you work your way down the course. Find a partner boat to run through the above scenario with you. It’s always better to have a second boat to tune against, and they’ll appreciate the practice as much as you do! You will be amazed at what the two hours of practice will do for you. Have a plan and execute it to maximize your limited time on the water. Make the most of your race and show up prepared. Racing is always fun, but winning is better! Squeeze in a couple of practice hours and give yourself the advantage.